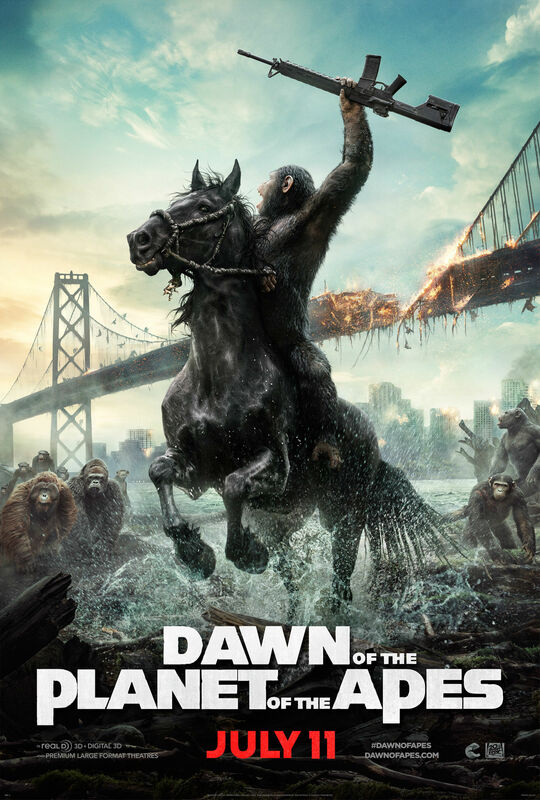 When the primates of Dawn of the Planet of the Apes hit the big screen on July 11, a lot computer wizardry will have gone into making Caesar and friends look like real apes. Let’s not forget that the realistic apes owe a lot to the talents of Andy Serkis and his fellow motion-capture artists! One of these years, Serkis will win the Oscar he deserves! Poor San Francisco… well, technically, poor Golden Gate Bridge. Whenever something bad happens there — sea monster attack, mutant war, kaiju invasion — the iconic orange bridge takes it on the figurative chin. In director Matt Reeves‘ upcoming Dawn of the Planet of the Apes, the future doesn’t look too bright for the bridge once again. What if somebody painted it a different color? If you don’t read USA Today (translation: You didn’t stay in a motel last night), you probably have not seen the clutch of excellent photographs 20th Century Fox released to the newspaper for Dawn of the Planet of the Apes. These images make me want to see the movie. Hear Bradley Cooper as Voice of Rocket Raccoon! At last, Rocket Raccoon of the Guardians of the Galaxy speaks! In this short little introduction to the character, Rocket says a few lines, and Bradley Cooper is shown delivering his voice performance. Check it out.